Grown in southern China and Taiwan, oolong tea, 烏龍茶 (phonetic pronunciation: “wu-long”), is one of the more popular teas in the world. Though its popularity has yet to be fully realized in the United States, oolong tea has been grown, fermented, and consumed for thousands of years. Although oolong tea is first mentioned in poems written in the Ming Dynasty (1368-1644), the tea is significantly older. It was originally known as Beiyun tea, and originated in the Tang Dynasty (618-907). Often used as a tribute tea, it was a drink offered as a sign of great honor. Oolong tea is a true tea along with white tea, green tea, black tea, and pu-erh tea. 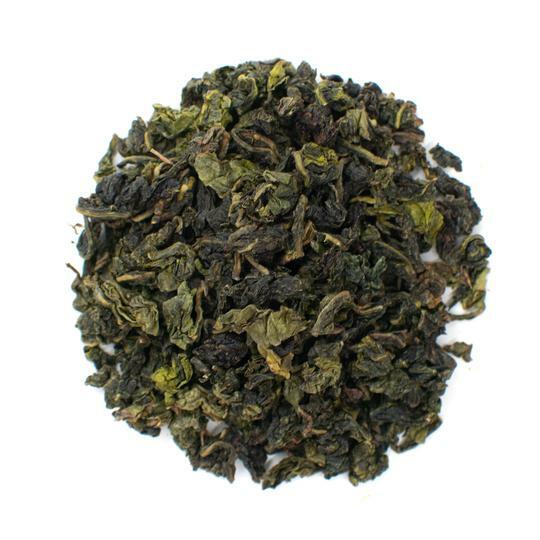 Though oolong tea is sometimes labeled a green tea, it's more accurately half green, half black. Oolong tea is partially oxidized, whereas black tea leaves are fully oxidized, and green, unfermented. Oolong tea offers a varied flavor profile thanks to its unique production method. Since oolong teas are only partially oxidized, there is a lot of room for tea masters to create special flavors and blends. 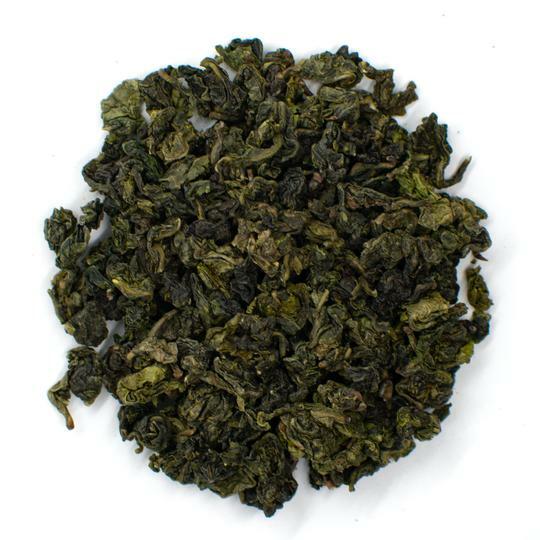 Most oolong teas are oxidized form 8 to 80 percent. The lightly oxidized oolongs offer a floral flavor that is airy and light-bodied. 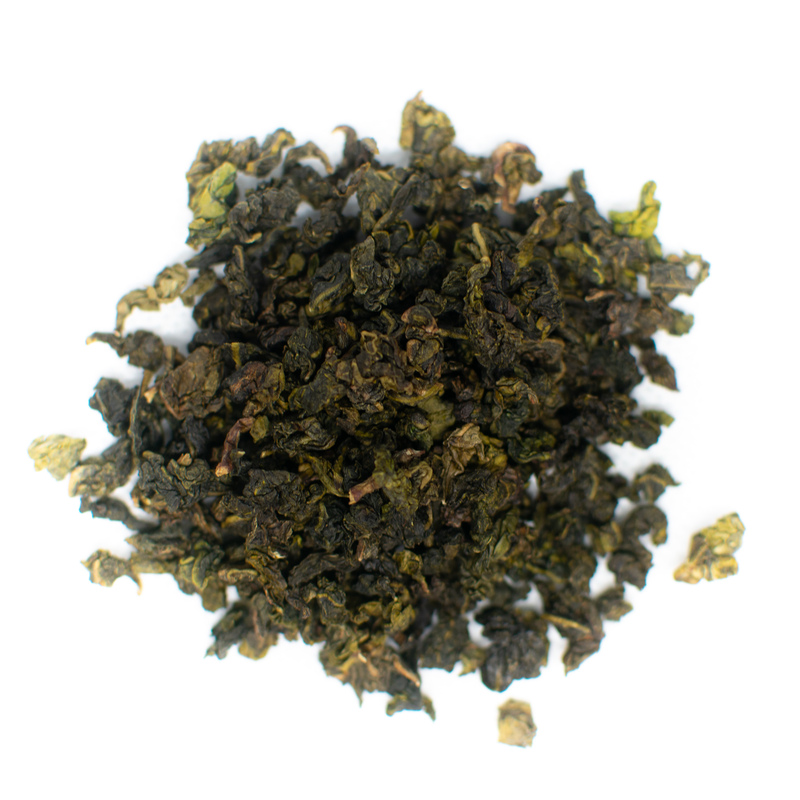 Heavily oxidized oolong teas boast an earthy flavor that is robust and fuller bodied. 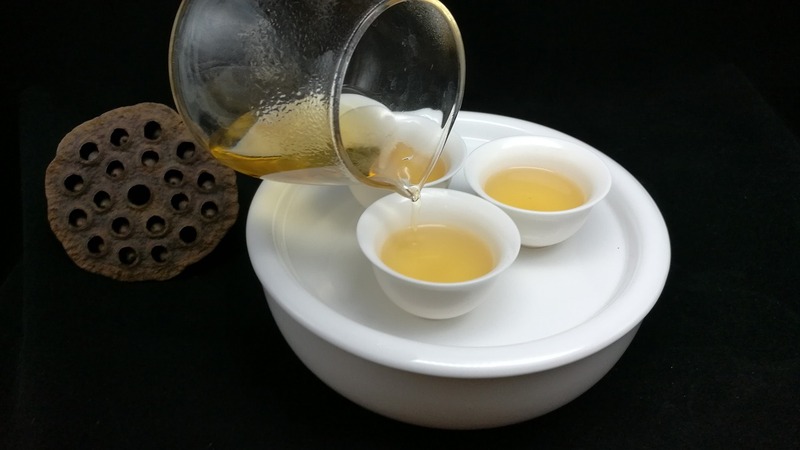 Although Chinese teas are famously touted for their medical and curative properties, it's only recently that Western doctors have taken note and begun studying oolong tea. 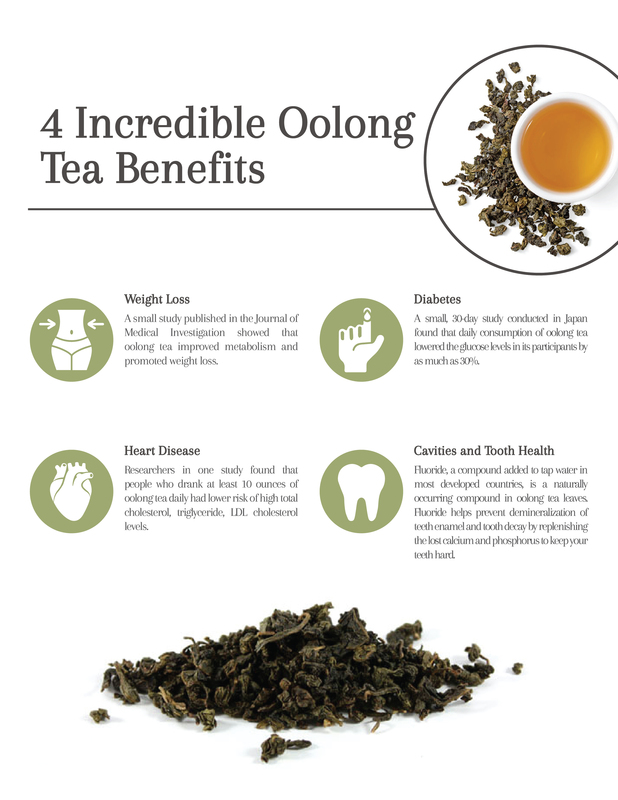 While not all of these benefits have been confirmed by the scientific research, doctors and researchers have observed that oolong tea does have some health benefits explained below. Oolong tea leaves come from a plant called Camellia sinensis, which has chemical compounds that were observed to reduce risk of a particular type of skin cancer (1). Researchers also found it reduced urinary tract symptoms (2). It also has less caffeine than green tea, making it an ideal drink for people with chronic heart diseases (3). A small study published in the Journal of Medical Investigation showed that oolong tea improved metabolism and may help you lose weight. The researchers tested participants' “Resting Energy Expenditure” and “Energy Expenditure” after drinking oolong tea, a green tea, and water. It found that people who drank oolong tea had a higher REE and EE than plain water and green tea both. This study suggests that if you are working on improving your fitness and losing weight, regular oolong tea consumption may help. Though oolong tea contains caffeine, the study found that properties of oolong tea, rather than caffeine, promotes fat oxidation, or weight loss. For this reason, oolong tea is a good option for people with cardiac problems, nursing mothers, or other people who cannot have large amounts of caffeine (4). Researchers have found a relationship between drinking oolong tea and lowering cholesterol levels: They found that people who drank at least 8 ounces of oolong tea daily had lower risk of high total cholesterol, triglyceride, LDL cholesterol levels. The research consisted of 76,979 individuals who consumed oolong tea daily for several years (5). Researchers also found that drinking oolong tea may prevent cardiovascular problems in people with type 2 diabetes (6). Experts attribute these health benefits to the presence of polyphenols and catechins in tea (7). In a separate study, researchers found that people who drink oolong tea daily also have a lower risk of heart disease in the long term (8). According to the National Cancer Institute, there is insufficient research to confirm that oolong tea reduces a person’s cancer risk. However, there are a number of small studies that suggest that oolong tea may inhibit skin, lung, and ovarian cancer (9). Laboratory and animal studies found polyphenol chemicals, which are naturally occuring in oolong teas, may protect cells from DNA damage, and possibly inhibits tumor cell growth. Tea polyphenols may also improve the immune system (10). While the early research in the efficacy of tea polyphenols is promising, researchers do not yet understand how or why it is effective, and are not recommending tea consumption in cancer treatment at this time. Researchers have found that drinking oolong tea did not improve blood sugar levels or insulin levels. However, drinking oolong tea may lower the risk of Type 2 diabetes and prevent diabetes symptoms. A small, 30-day study conducted in Japan found that daily consumption of oolong tea lowered the glucose levels in its participants by as much as 30%. However, a separate study found that consumption of caffeine, which is found in oolong tea, also lowered glucose levels in patients with Type 2 diabetes. The researchers concluded that a larger study with a bigger sampling of participants should be conducted (11). Fluoride, a compound added to tap water in most developed countries, is a naturally occurring compound in oolong tea leaves. Fluoride helps prevent demineralization of teeth enamel and tooth decay by replenishing the lost calcium and phosphorus to keep your teeth hard. Naturally occurring fluoride, such as that found in oolong tea, may also prevent cavities (12). Oolong tea contains an amino acid known as L-theanine. This amino acid helps to inhibit the release of caffeine, resulting in a longer-lasting energy kick. Since the energy boost is smoother, you don’t have to worry about the highs and falls associated with drinking a standard cup of coffee (13). Consuming oolong tea also helps to rid the body of toxins that can cause damage to healthy cells. Oolong tea contains catechins and antioxidants that help to prevent free radicals from taking root (14). Free radicals are uncharged cells that bind with healthy cells and cause oxidative stress—the body’s form of rust. Oolong tea contains a moderate amount of caffeine that may cause problems for people who are sensitive to caffeine. Oolong tea contains 50-75 milligrams of caffeine for every eight ounce cup. In comparison, a standard cup of coffee contains anywhere from 95 to 200 milligrams of caffeine for the same amount. Caffeine can cause a range of problems including stomach upset, dizziness, irregular heartbeat, and headaches. Experts recommend limiting your caffeine intake to 400 milligrams per day (15). That means you can drink several cups of oolong tea per day without any negative side effects. If you are sensitive to caffeine, drinking tea may cause side effects a normal individual won’t experience. Keep tabs of your caffeine intake and dial it back if you suffer any negative side effects. Experts recommend consuming a maximum of two cups of oolong tea if you are pregnant or breastfeeding. That’s because most research shows limiting caffeine intake to 200 milligrams is ideal for pregnant women. Caffeine may cause irritability in infants who breastfeed and can cause premature delivery and lower birth weights if consumed in excess when pregnant (16). Do not drink large amounts of oolong tea in combination with stimulants. The caffeine in oolong tea may cause increased heart rate and complications when consumed with stimulants. Oolong tea should be used with caution when taking medications for irregular heartbeat. Avoid drinking oolong tea 24 hours before a stress test as the ingredients may interact with the adenosine given during a heart stress test. 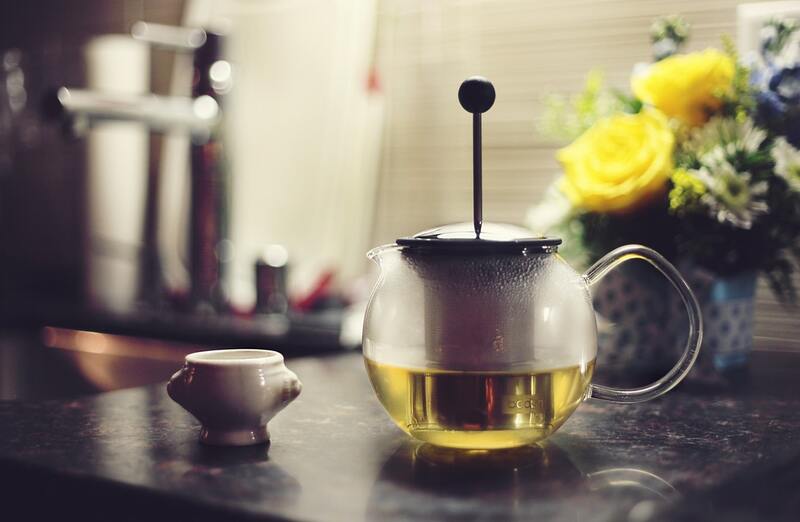 Drinking oolong tea along with antibiotics may cause jitters. That’s because some antibiotics including Cipro and Trovan decrease the body’s ability to break down caffeine. 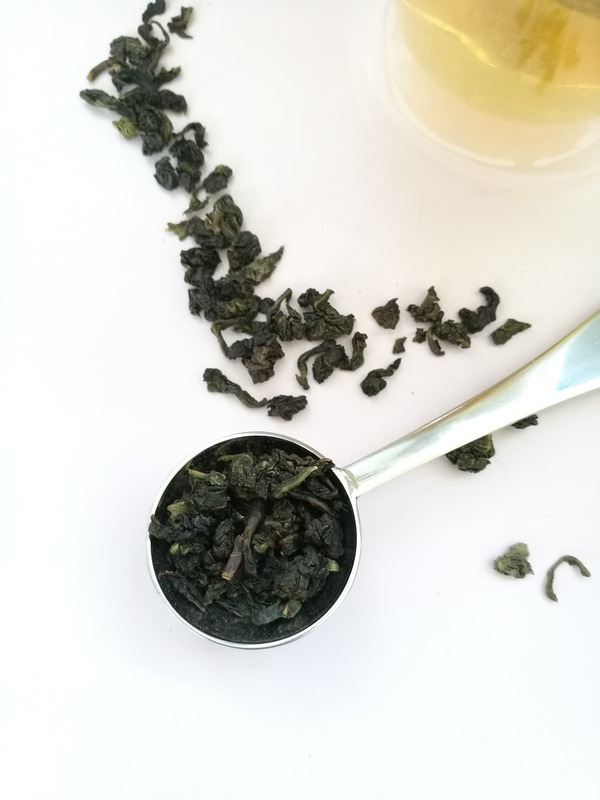 Whether you're new to tea or a self-professed connoisseur, oolong tea is a great drink to try out. It's neither overly sweet nor bitter. Regular tea consumption may minimize a number of health issues like high blood pressure, skin disorders, and heart diseases. Making a cup of tea allows you to take a beat. Try meditating while you prepare your perfect cup of tea. Developing a tea routine of your own can be a source of relaxation in your otherwise chaotic day. Reduced stress may translate into fewer headaches and better long-term health. And its lower caffeine content means you’re less likely to be afflicted by insomnia. Oolong teas have a marvelous complexity that evolves as you develop your tea-making skills. The next time you make a cup of oolong tea, examine its flavors and scents. Does it taste fruity and sweet? Nutty? Woody and reminiscent of smoke? Or milky with a hint of floral scent?